The Hughes & Kettner TriAmp Mark 3 features six independent channels that represents an entire era of tone and each of these six eras can be routed to three independent tube power amps. You can also combine two or even all three of the power amps, merge different power amp characters, and play TriAmp Mark 3 with up to 150 watts of sheer tube power. This lets you custom tailor your amp in the amp, recalling up to 128 sound constellations with the touch of a button via MIDI. 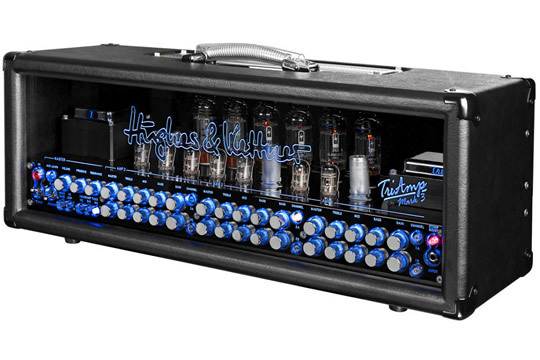 The TriAmp Mark 3 leaves Hughes & Kettner's factory in St. Wendel, Germany equipped with two pairs of 6L6 power tubes and one pair of EL34s, but it works equally well with other tube types, too. The revised TSC System — Tube Safety Control, which automatically and constantly biases tubes and keeps your amp in good health — allows you to combine KT66s, KT77s, KT88s, 6550s, 5881s, 7581s and/or 6CA7s.